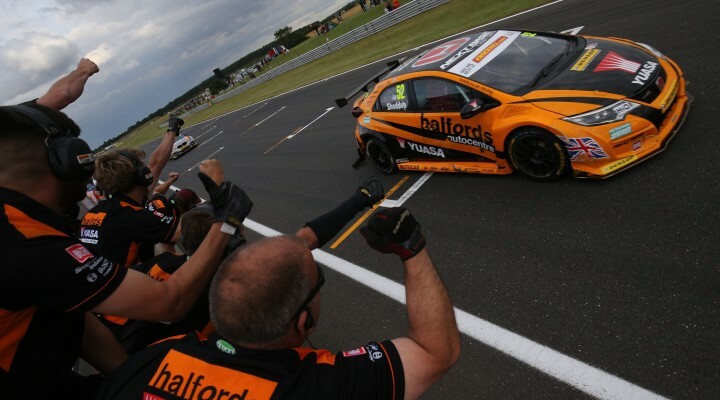 Reigning BTCC champion Gordon Shedden completed a sensational day of entertainment by snatching an unlikely last lap victory in the final race at Snetterton. A dramatic accident brought about the second red flag of the day when contact down the order between Mark Howard, Alex Martin, Ollie Jackson and Hunter Abbott sent the latter into a barrel roll. Abbott’s Power Maxed Racing Chevrolet spiralled over the barrier and into a television gantry, leaving a cameraman and several drivers shaken but thankfully unharmed. Pole-sitter and then championship leader Sam Tordoff broke down before the race could restart with the BTCC seemingly providing yet another twist to the title race. The relentless drama was far from over, however, as Tom Ingram and Adam Morgan were shuffled down the order early on in the shortened ten lap encounter. Jason Plato had taken control at the front for Silverline Subaru BMR Racing – chasing his first win of the season – but he couldn’t hang on as Collard muscled his way past on lap two. Shedden’s Honda was busy flying through the order and he disposed of Rob Austin’s Toyota for fourth on lap three. Mat Jackson nipped by Plato for third, with Shedden following suit, but third became second for the Scotsman when the Motorbase Ford slowed with a problem on the Bentley Straight. The Honda Civic Type R began reeling in Collard’s West Surrey Racing BMW at a rate of knots and was eventually on his tail during the final lap. He fired his #52 machine down the inside of the Team JCT600 with GardX BMW and the duo ran side-by-side for what seemed like an eternity. Collard eventually had to give up the challenge and settle for second, as Shedden stormed to a sensational victory. Handy Motorsport’s Austin claimed a hugely popular podium as he fended off Plato, Andrew Jordan and Colin Turkington at the chequered flag. Morgan won the battle of the Mercedes’ as he bounced back from the earlier incident to claim seventh, ahead of Laser Tools Racing’s Aiden Moffat. Josh Cook’s MG and Matt Neal’s Honda completed the top ten order, with the latter also moving into third in the standings. Collard now leads the way by three points from the unfortunate Tordoff.